Registered Thai Wedding is legally recognized in all countries. If you are planning on having you wedding in Thailand to be a legalized marriage you first must have the proper documentation in hand. The following are the steps that are the services and steps taken the in order to assist you in making your marriage legal. This will give you an idea if you try and tackle the procedure by yourself. However if you would prefer to spend you time enjoying the pleasures of your stay here in Thailand, we are here to help you with all the details at the specific Government Departments. Our representative will help you arrange the meeting. You will need to take your passports and two photocopies of the passport pages that have your photo as well as 2 photographs. You should arrive in Bangkok at least 2 to 3 days prior to your planned wedding, this will give our staff enough time to process the documents and translation. if neither of you has been widowed or divorced, no other documents from you embassy will be required, however if either of you has been previously married, you will need to supply our Bangkok representative those documents assessing to that fact. If you like to get visit to the embassy on the day of your arrival make sure that day is not a Thai holiday or your country's holiday. (All embassies are close during holidays). Our representative will either meet you at your hotel in Bangkok to pick up your sworn statements which have been endorsed and stamped by your embassy’s consular, or you can sign power of attorney allowing us to pick the documents for you. ( The reason is based on your nationality). The embassy can take up 1-2 days to process your documents and this allows you to continue your holiday immediately. The completed documents are sent by one day express courier to our office in Phuket. Once we have received the documents in our office, we will take them to the District Official and it will only take 1 day for them to check for accuracy. Finally, we arrange the District Official to be present at your ceremony, where he will ask you to state your names and professions and 1 or 2 other simple questions. He or She will then present you with marriage certificate. 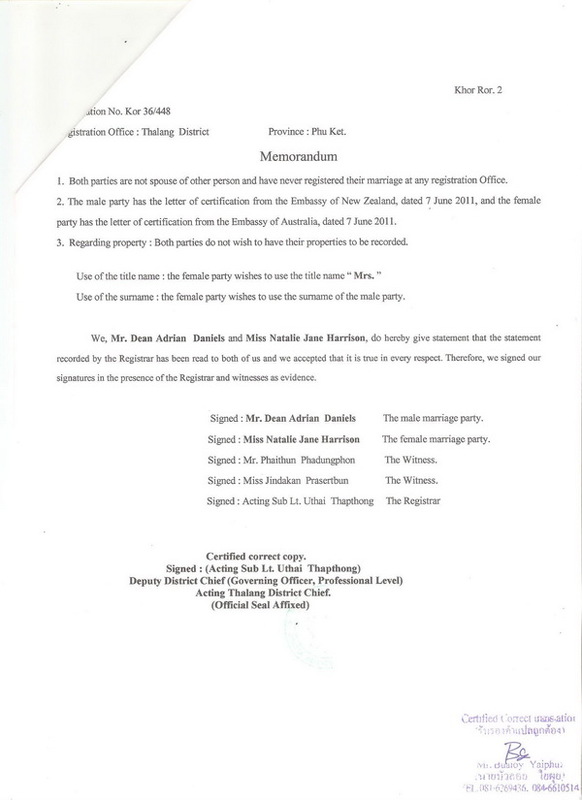 After you sign this, you are officially married as required by Thai law. To ensure your marriage is officially recognized in your own country, it is also good idea for us to have the marriage certificate translated into English. Once the legal requirements are met, you can then decide what type of ceremony you would like to celebrate. The following is a list Things the couple must prepare for legal marriage. 2. 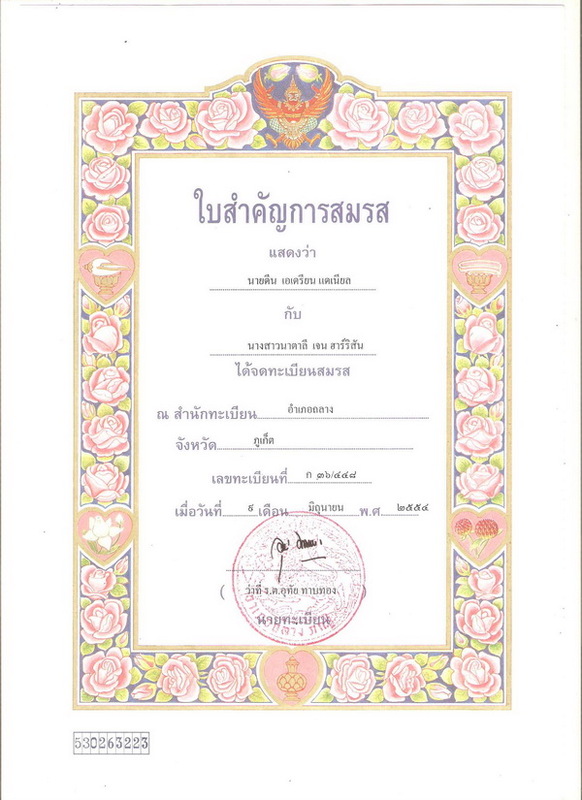 Certified letter or documents from your embassy indicating you wish to get married in Thailand with your personal details (name and address, parent's names and nationality). 3. 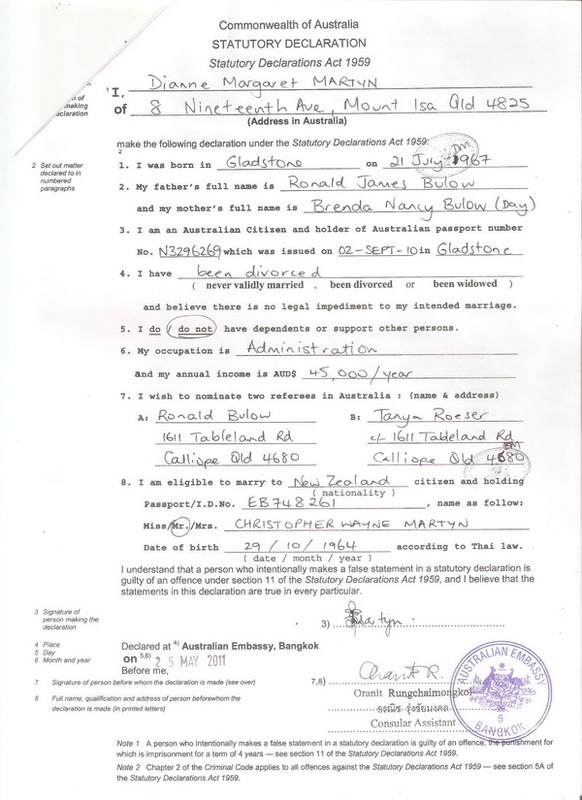 Divorce document if married before. 4. All documents should be translated to Thai language. - Our legal representative in Bangkok fee. - Official translate to Thai of the embassy statements. - Round trip transfer from hotel to embassy. - Affirmation by the Ministry of Foreign Affairs in Bangkok. - Submit the documents to the registrar office 1 day in advance. - Registrar at the location on the wedding day. 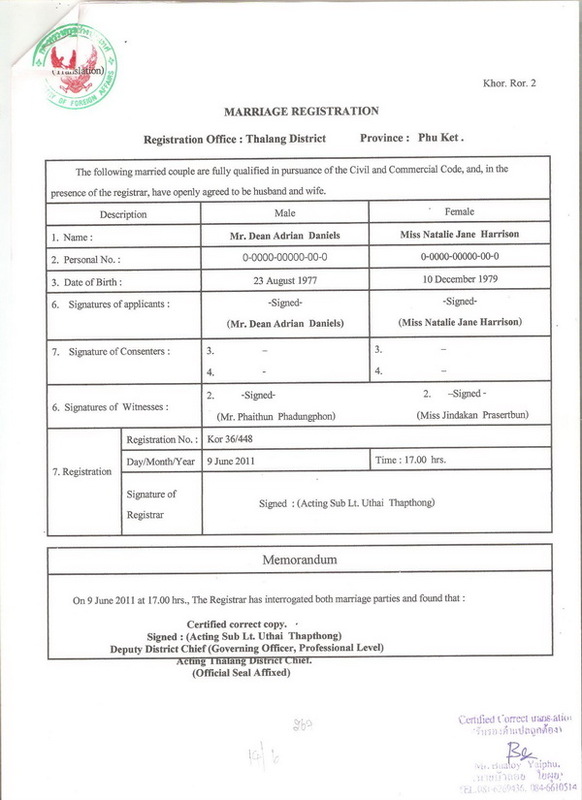 - Official translation from Thai to English language of the wedding certificate and registration. - Post the document to your home address or drop off at your hotel.